A peace candle is lit at the start of each act of worship at Stirling Methodist Church. And for more than 25 years members have been taking peace candle gifts around the world. Peace candles are now lit in churches around the UK and in Australia, Fiji, Palestine, South Africa, USA and other places. Read the peace candle story below. Many years ago a couple from America were visiting Russia. Towards the end of their visit they went into a Cathedral in Moscow to look around. They had finished looking around and for a few minutes stood quietly near the door taking in the whole of the interior of the building. They noticed that there was a steady number of people, mainly older women, coming into the church, going to the front, dropping a coin into a box, taking a candle, lighting it putting it on a stand and then praying. Some prayed for a short time, others longer. It seemed to these visitors that this cathedral was never without someone praying in it. One of the women, having finished praying, started to walk towards the door, then suddenly turned back, dropped a coin in the box and took a candle. Instead of lighting it she turned and walked over to the two visitors and gave them the candle. On handing the candle over she said to them. 'When you go back to your own country and go to your church take this candle, light it and pray for peace'. With that she turned and left. The American visitors were taken with this simply request, but they had a problem, they were Baptists and in their church they never burnt candles. They decided to take their problem to their minister and when they met with him they took the candle and told the story. His response was, 'Bring the candle to church on Sunday and at the beginning of worship I will invite you to come forward. You will tell the story of the candle, put it on the communion table, light it and lead us in a prayer for peace'. Towards the end of the service, when the candle was in danger of burning out, the minister produced another bigger candle, lit it from the first and placed it on the communion table. At the next service he lit the candle again and prayed for peace. After a few weeks the congregation was buzzing with conversation about this candle. Not the way that the couple who had visited Russia feared but in a new way. If an unknown Russian woman could give their church a simple candle and challenge them to pray for peace why shouldn't they give candles to their friends in other churches and challenge them to pray for peace. So they did and in giving away the candles they told the story of the Russian woman. They also challenged churches to give a candle to another church or churches and ask them to do the same. 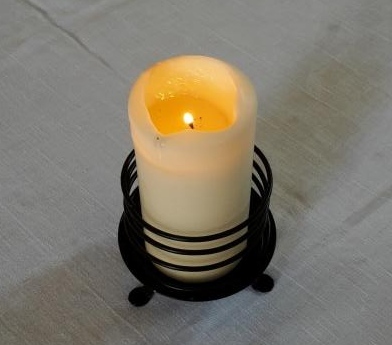 So the candle of peace, as it became known, was passed from church to church, it came to Scotland, to Leith Methodist Church and then to Stirling Methodist church. We in turn sent out a few candles to other churches. On the morning of the 24th. August 2014 we repeated what we did 25 years ago, sending out some candles to other churches and ask them to place them in their churches, light them at services and pray for peace. The Stirling Peace Collect was composed by Rev. Dr. Roger Walton (President of Conference 2016) and Rachel Lampard (Vice-President of Conference 2016) after receiving a peace candle in April 2017.
and give us courage to face the pain of the world with hope; that peace and justice may triumph everywhere. Amen.